The Rupee 1 videos from Airtel were quite a big success, especially after they popularized it through a series of interesting TV commercials. Given its success, Airtel has now expanded their Re. 1 offering for Facebook, Email, Songs, Photos along with the videos. Airtel has now grouped all their Re 1 offerings under “Re 1 Entertainment Store” – Customers can simply dial 56789 from their Airtel mobile phones to subscribe and get started with it. Along with wide range of content like music, videos, games, subscribers can also have internet browsing offers for Re 1. Customers can access the store by simply opening their mobile browser and point it to http://one.airtellive.com and follow download process that will provide access to Re 1 store on their mobile phones. Alternatively, customers can also call toll-free IVR 56789 and receive a WAP link as an SMS. Clicking on the link will lead customers to the entertainment store download process. According to press release sent to us, the Re. 1 entertainment store has over 3 million videos, games, songs and photos available across languages, genres and devices. The Re. 1 internet browsing offer includes access to Facebook, Yahoo mail, Twitter, Linkedin and more. Customers will have 3 MB of bundled data per day. Post 3 MB, users will have have to pay volume based charges or will have subscribe to various data packs available. Also, customers have to note that access to these websites for Re 1 will be possible only through the downloaded entertainment store. The access from your regular browser may not be part of Re 1 offer, and may be charged separately. Why Airtel if Offering it so Cheap? 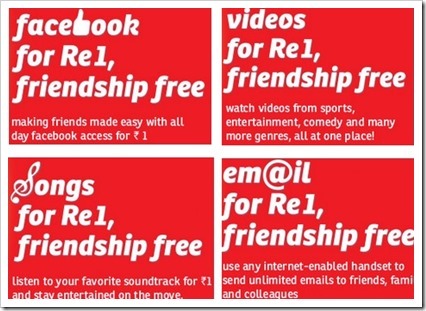 The Re 1 offers from Airtel are not for regular mobile internet users – They are introduced to grab new users. Data access is what most operators are counting on to be their next growth engine. Schemes like these reduce the barrier of entry for new users. And once they are hooked on to all the good stuff, they obviously graduate to volume based pricing or subscribe to data packs, which is what Airtel is really counting on. Airtel plans to rollout a high-decibel campaign comprising of 4 TV commercials for the launch of their ‘Re 1 Entertainment Store’, just like they did during the launch Re 1 Videos. You can see one of the videos from the campaign here. What do you think, will this take off? Updated: 30 Pakistani Websites Defaced By Indian Hackers, They Bring Down MTNL Mumbai Website! India’s Internet Packs Are The Cheapest In The World! Is Jio The Reason?